Camping in Normandy Facing the English Channel in the northwest of France lies the region of Normandy, well-steeped in historic battles and Romanesque architecture. With its convenient location and limitless variety of activities for the whole family, you should choose Normandy as your next camping holiday. 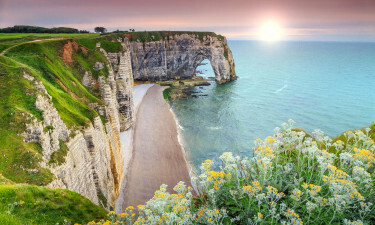 What makes Normandy an excellent holiday camping destination? Along with historic military and architectural attractions, Normandy offers captivating beachside settings for family holiday camping. Experience Normandy’s glorious past whilst keeping a foothold in all the modern conveniences of a LUX-camp mobile home or bungalow tent. A 20- minute drive from the Caen Ferry port will bring you to the Cote de Nacre. The luxury camping accommodations include tent bungalows and mobile homes. Nearby attractions are the seaside resort of St. Aubin-sur-Mer, the D-Day landing beaches, and the town of Bayeux. Submerge yourself in historic Normandy on a preserved 18th-century estate at the luxury camping site, Château Lez Eaux. Château Les Eaux is located in Lower Normandy just north of Brittany. Camping luxury is yours at this site in a LUX-camp bungalow tent or mobile home. Camping du Golf has all the amenities you expect from LUX-camp, plus a full onsite golf course. This camping luxury site is located in Lower Normandy near a sandy beach. A climb up the seaside bluffs rewards you with a vista of the Channel Islands. The plentiful sandy beaches, chalky-white seaside cliffs, lakes, meadows, and wooded areas of both Upper and Lower Normandy provide family-oriented mobile home camping settings. 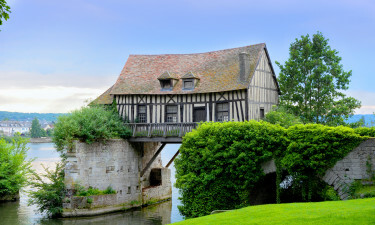 Today, Upper Normandy tends more towards industry whereas much of Lower Normandy is agricultural land with rolling countryside replete with dairy farms and apple orchards, both of which feature largely in Normandy cuisine. Natural environments with their native flora and fauna are protected in 4 regional natural parks that are open to visitors. 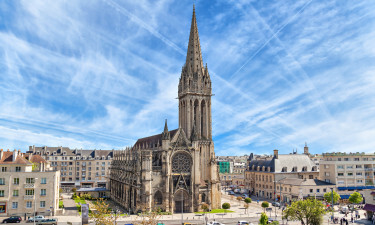 If your time is limited in Normandy, the must see cities are Mont. St. Michel, Bayeux, and Rouen. 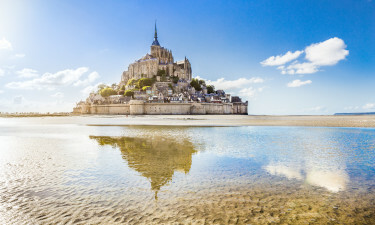 On the seaside, the rocky island of Mont St-Michel, with its abbey and tiny village of under 50 residents, is accessible by foot or shuttle. Rouen has an exquisitely restored medieval quarter, a majestic Gothic cathedral, and excellent museums. The young Joan of Arc was tried in Rouen and met her end in the central square in 1431. Bayeaux hosts the Bayeux Museum with its miraculously intact tapestry. Normandy’s early history is captured in the Bayeux Tapestry. The tapestry depicts scenes leading up to the Norman conquest of England and culminating in the 1066 Battle of Hastings. Normandy is the site of history’s largest seaborne invasion. Allied troops stormed the beaches of Normandy on June 6, 1944 in an operation proved to be the turning point in WW 11. The landing beaches, American War Cemetery and Memorial at Colleville-sur-Mer, and the British War Cemetery at Bayuex, are all popular sites.